Comments: Grant Kelly (Nee: ) | St Joseph MO USA | 1851-1900 | Comments: Click below to see other photos from this Album . This album was donated to DeadFred by Janice Taylor .She writes “Enclosed are pictures from my Great Grandfathers Albums . Two huge books that contained his school mates and friends much like our high school annuals . I’m assuming the pictures are from 1885 through 1890 maybe earlier but can’t prove it. 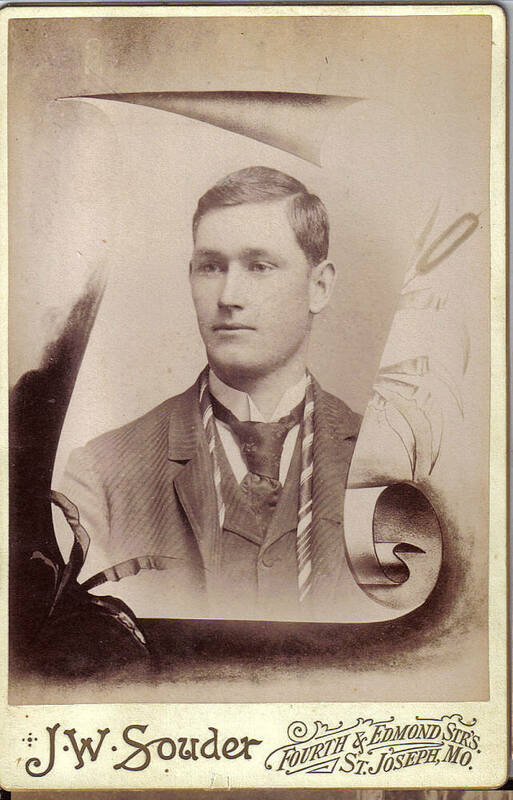 Edward Milton Peters Married Oliva Florence Wright on October 12, 1890. She died in Childbirth in 1897. He never remarried. He attended country schools and completed education in Normal & Scientific courses at North Western Normal School in Stanberry MO, He taught in a number of schools in Andrew County, Mt Craig School being one of them , He organized the Cosby State Bank in 1901 . He organized the first bank in Rushville, MO in 1904 . He lived in Rushville, MO for many years and spent the remainder of his life in St Joseph, MO. He died in 1941.